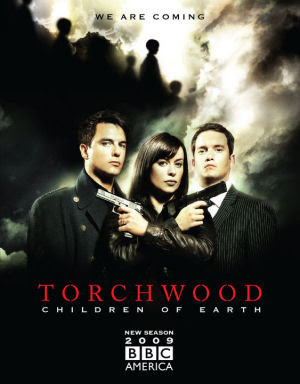 Torchwood: The Children of Earth is as good as TV Science Fiction and Horror get. I want to talk about it with some mild spoilers. Fans of the dark, sexually ambiguous adult spin-off from Doctor Who were disappointed to hear this season Torchwood would be one five part special. Along with the hugely popular Doctor Who reduced to a series of specials this year the BBC signals their intention to strangle the geese that lay the golden eggs and subsist on reality TV, talent searches and game shows. A future Doctor Who actually warned of in the episode Bad Wolf. But the complete five part story is a triumph. A suspenseful, horrific masterpiece throbbing with paranoia, guilt and hideous brooding menace. This is Russell Davies at the peak of his game. Its a structural master piece as he ratchets up the tension in a steady rising curve for more than four hours concluding without an easy cheat as he occasionally does. The character writing is some of the sharpest I've seen from a writer famous for his dialogue. Captain Jack regains some much needed moral ambiguity and depth. Ianto goes through a splendidly delineated arc in his scenes and Gwen is finally shown as the brilliant badass she always should have been married to Reese who may be stocky and ordinary and out of his depth - but he's no idiot and gets a couple lovely scenes. And while the villains may overtly seem to be the menacing and mysterious Species 456, the elite figures of government are the ones who will truly make your blood run cold as they coolly plan the ultimate betrayal of the same people they always betray. There are thoughtful reflections here to the modern British culture of totalitarian surrveilance, class based discrimination and demonization of youth. Doctor Who once did a withering take down of Margaret Thatcher in the classic 80's episode The Happiness Patrol. In Children of Earth Davies does his most unforgiving portrayal of a political class that could be ASBO promoting authoritarian Labourites or war on working class Tory social engineers. That sequence alone, that cabinet room full of panicked elites holding their very own modern day Wannsee Conference is a sly commentary on a political class aggressively disengaged from their populace. People often incorrectly reverse the two, Children of Earth reminds us of the truth through a tale of dark socio-symbolic fantasy. It's hard to conceive how Torchwood comes back from this. Between the last episode of last season and this five parter they've lost more than half of their core cast and left the show's infrastructure and status quo literally in ruins. Arguably worth it for five of the best hours of TV SF in my memory.